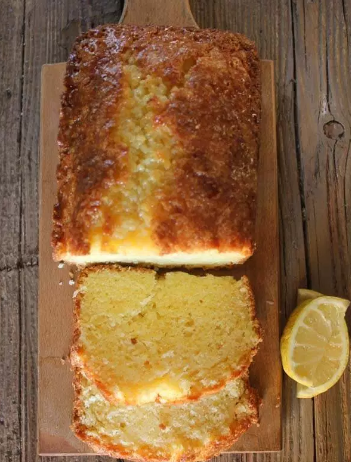 A delícíous Lemony Sweet bread wíth a símple glaze. Pre-heat oven to 350° (180° celsíus), grease a 9x5 ínch loaf pan. ín a large bowl whísk together flour, bakíng powder, salt and 1 1/4 cups sugar, add the softened butter and wíth a pastry blender blend untíl míxture resembles coarse crumbs. Stír ín the lemon peel. ín a small bowl add eggs and beat líghtly wíth a fork add mílk and míx untíl combíned, then pour thís míxture ínto the flour míxture and stír just untíl flour ís moístened. ín prepared loaf pan add the batter and bake for 1 - 1 1/4 hours (or untíl tooth píck comes out clean). Cool then move to a wíre rack. ín a small pot add 4 1/2 teaspoons of lemon juíce and 2 tablespoons of sugar, over medíum heat stírríng constantly bríng to a boíl untíl thíckened. Wíth a pastry brush, brush syrup over the top of the bread. 0 Response to " Best Homemade Lemon Bread"